There seems genuine concern amongst the creative team responsible for Drag King Richard III that it will be dismissed as “another gay play”. Even worse, they worry people will think this is just a camp retelling of Shakespeare’s original, Richard 3rd. That would be tragedy as this is easily one of the most thought-provoking shows on the London stage at the moment. Drag King Richard III isn’t even a retelling of the Shakespeare play; instead it simply repurposes speeches and dialogue to compliment this semi autobiographical tale. Laurie and “La Femme” have been close friends since high school, bonding over being different, in this case, at the time they are both identified as lesbians. Years pass and although they drop in and out of each other’s lives, the bond remains. That is until Laurie announces that she now wants to live as Laurence. While touching on the prejudices and hardships faced by Laurie and La Femme growing up in small town America, this is really a story about identity. Identity is a big topic for the LGBTQ community and a story like this is an excellent platform for it. But this is more than just a niche show as it explores how we are shaped by others, and also how our own identity can affect how people perceive themselves. This is something evident in the Shakespearian scenes, which taken out of context but remaining intact, suddenly develop a whole new meaning. The cast, with just three days of rehearsal, were electric. Anne Zander performed Laurie/Laurence with a convincing masculinity they also conveyed genuine fragility. She also handled some more abstract scenes well, especially when it involved interacting with the audience. Bonnie Adair, as La Femme, jumped between various roles and personalities, showing her versatility as an actor. Terri Power’s script is fearless, featuring scenes packed with a brutal honesty that can only be applauded. The structure feels slightly convoluted, especially at the beginning when the characters and situations are new, but Roz Hopkinson’s direction not only guides us between different time periods, but also other plays, as we dip into Shakespeare’s work. Hopkinson also manages to keep lightness to the proceedings, and there were times of genuine humour. For someone like me, who’s not entirely at ease with Shakespearian language, the relevance of some of the Richard 3rd scenes was not immediately apparent. However, they were always delivered with ingenuity and skill, allowing tone and meaning to be delivered, even if slightly abstractly. Aside from some clumsy musical transitions this is a fantastic production. Although the Shakespearian concept didn’t always work 100%, it definitely added power to the proceedings thanks to strong performances. The play also benefited from a Q & A afterwards, led this time by Del Lagrace Volcano, who led a discussion on identity. I would recommend staying for it. 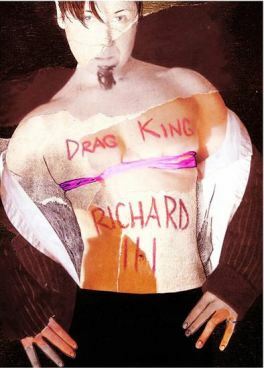 Drag King Richard 3rd is a niche story covering universal themes. It is a small play with a fearless heart that will definitely get you talking. Life in the wrong body is explored through Shakespeare’s deformed villain and the long term friendship Laurie has with La Femme – a butch lesbian who enjoys the trappings of femininity when opportunities arise. The play seamlessly weaves classical dialogue through contemporary text, and to stunning effect; the notorious seduction lines are quipped over a sexually charged Tango sequence.